There was a bank of rhubarb growing along the driveway of my childhood home, and my mother baked it into pies, combined with apples. I didn't learn until years and years later that the more common combination is rhubarb with strawberries. Although I enjoyed rhubarb when it came my way, it's been a long time since I've eaten rhubarb, and I've never baked with it myself. So this week's recipe for the Tuesdays With Dorie baking group was an exciting first for me. Luckily our local grocery store had some fresh rhubarb in stock (thank goodness I asked the produce manager; the rhubarb was in the back) and some decent strawberries, so I was all set to bake this dessert. - The recipe was chosen for the group by Sarah of Teapots and Cake Stands. Check out her blog post to find the recipe. - I made half recipe of this crisp, in an approximately 6" squar-ish ceramic baking dish. I really like this dish, but it's really red. In the ideal world it would be a different color when baking a crisp with a red filling that bubbles at the edges. However we all know this world is far from ideal; the dish was the right size so that's what I used. 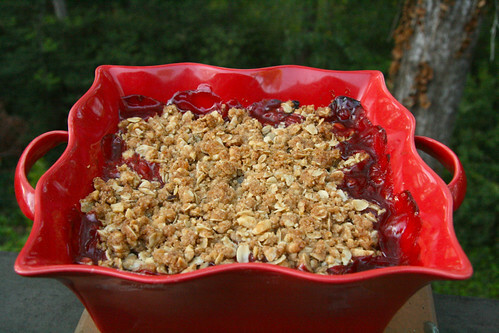 - The "double" part of this crisp reflects the fact that in this recipe there is double the amount of crisp topping; half is pressed into the pan to form a bottom crust and the rest is reserved to be crumbled over the top of the fruit filling. - Strawberries can be a watery fruit for baking, but Dorie solves this problem by cooking the strawberries with sugar and making a saucy filling by thickening them with a cornstarch slurry. This is then poured over the cut rhubarb, topped with the crumbs and put into the oven for a leisurely bake. - On the advice of Caitlin at EngineerBaker, I cut the amount of sugar by about a quarter. The strawberry filling was still plenty sweet when I tasted it. - The unusual part of this recipe is that it uses ginger in all components: ground ginger and chopped crystalized ginger in the crust/topping mixture and ground ginger in the filling. - I love walnuts and was excited to include these in the crust/topping. I made sure to chop the nuts finely so that they would seamlessly combine with the oats. - The crisp was hot and bubbly when I pulled it out of the oven. I spent a bunch of time trying to capture a picture of the crisp in mid-bubble, to no avail. - We ate the crisp plain, in order to taste it more completely. This crisp was absolutely delicious! I think it might be my favorite fruit dessert of all time. The rhubarb was meltingly tender and the flavor blended with the strawberry and ginger to produce a fresh, bright, intensely fruity filling that was tempered by the buttery, sweet, crunchy (thanks to the nuts), crust and topping. The oats and the ginger really took this one over the top. Sarah, I'm so glad that you cared so much about rhubarb that you chose this recipe, and also glad that rhubarb was seasonally available around here when it came time to bake the crisp. I can't wait to bake this one again! Honestly, I think your cute red dish color coordinates with the crisp a lot better than my green one does. =) We'll definitely be having this one again soon. I can't wait to try it with some different fruit combinations. I love your red dish! I need to try making this with the rhubarb and the ginger (I didn't have either) because of your glowing recommendation. Great job! What a classic. I love the sound of this! Only the artist you would be stressing about the color of that dish with the color of the fruit, etc.! That dish is gorgeous...love the shape, size, and color! I agree, Top 5 in desserts for sure. Yours looks wonderful. I like the red dish with red fruit inside.....it is nice for the simple-minded dessert folks who are faced with a a whole buffet of choices. I really liked this recipe, although I wish I would have used a little less sugar. I thought the ginger in the crumble was the best part! Love love love this one. Your dish is adorable! So glad you rediscovered rhubarb! So glad you enjoyed this! Thanks for baking along with me! I love your red dish - it's so bright and pretty! I'm glad we baked this together, it was nice not to be making my TWD at the last minute :) I agree, a definite contender for favorite fruit dessert, this one is awesome! i am never able to properly capture action shops, like mid-bubble or rising steam. this is one of the best crisps i've had.